(TAP the flag to Switch the Currency.) The Family Herbalist Certificate Starter Bundle consists 3 Certificate courses and 1 masterclass. It’s the perfect bundle to get your new learning adventure off to a great start without breaking the bank. If you don’t see the ADD TO CART button please contact support at didi@nutriserve.co.za. Explore the fascinating world of the family herbalist. Learn how to take better care of yourself and your family, naturally. Use coupon code LEARNFREE to gain free access for 30 days. Free access does not include the Course Certificate and Lifetime Access. See Description below for more details. 30-Day Money-Back Guarantee! (TAP the flag to Switch the Currency.) UPDATED AND EXPANDED! 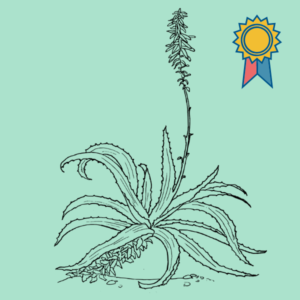 Reach Milestone 3 in your herbology learning adventure. 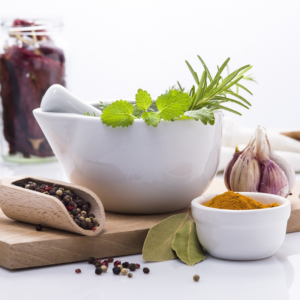 In Working With Nature's Apothecary you’ll learn seven simple but effective natural treatment protocols that focuses on key body systems and the ailments that plague them. 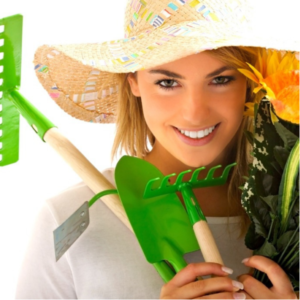 This is do-it-yourself natural healing and herbalism at its very best. 30-Day Money-Back Guarantee! (TAP the flag to Switch the Currency.) Reach Milestone 4. Take your interest in and passion for medicinal plants to the next level. 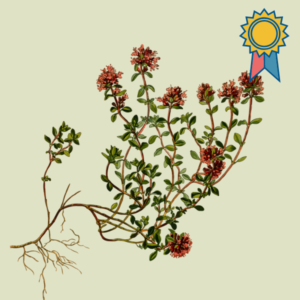 Discover the 'secret world' of botany, plant taxonomy and plant identification. 30-Day Money-Back Guarantee! (TAP the flag to Switch the Currency.) From Enrollment to Harvest in 6 Weeks. Simply apply what you'll learn in this masterclass and you’ll have your first pesticide free herbs and veggies on the table in 6 weeks. Or even less. Must-have foundation for anyone wanting to grow their own herbs, especially those dreaming of making their own herb products. 30-Day Money-Back Guarantee! 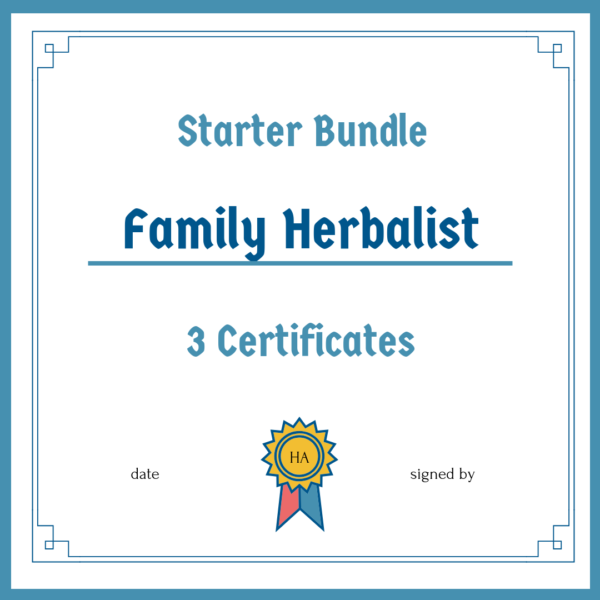 The Family Herbalist Certificate Starter Bundle consists of 3 Certificate courses and 1 masterclass. It’s the perfect course bundle to get your new learning adventure off to a great start without breaking the bank. For Reviews please see the individual courses. 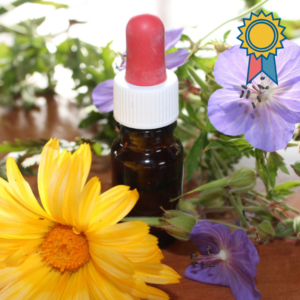 This course enables you to use herbal remedies safely and with confidence. 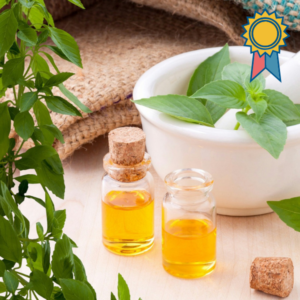 It also introduces you to the various disciplines that the family herbalist must be familiar with which enables you to pursue the disciplines that interest you the most. 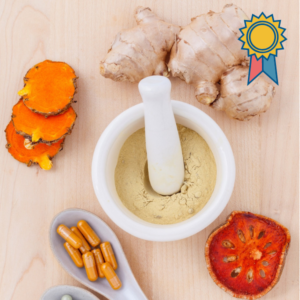 In Nature’s Apothecary you’ll learn the philosophy of natural healing and you’ll gain firsthand experience in using seven simple but effective natural healing protocols that focuses on key body processes. 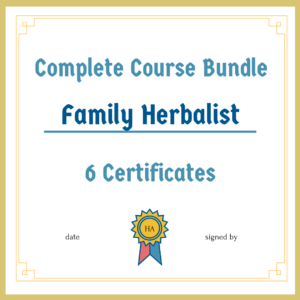 Basic botany and plant identification are absolutely essential skills in the repertoire of the family herbalist, traditional healer or holistic health and wellness coach. In this course you’ll discover the ‘secret world’ of botany, taxonomy and plant identification and you’ll take your professional interest in medicinal plants to the next level. From Enrollment to Harvest in 6 Weeks. Simply apply what you’ll learn in this masterclass and you’ll have your first pesticide free herbs and veggies on the table in 6 weeks. Or even less. NB! You don’t need to do the courses simultaneously. You can do the them one after the other at your own pace. For a description of the pre-requisites for this program please see our Terms of Service. We regularly update and expand the contents of all our online learning programs. Whenever we do you’ll automatically have access to the latest course material. Have questions about this course bundle? Call or WhatsApp +27 084 400 9841. If you don’t see an ADD TO CART button please contact support at didi@nutriserve.co.za.